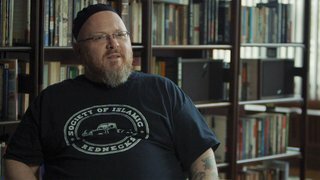 Redneck Muslim follows the life and work of Shane Atkinson, the first Muslim chaplain in-training at North Carolina’s biggest trauma center and founder of the "Society of Islamic Rednecks.” Seeking to celebrate Southern culture with a reformed vision of “redneck” identity stripped of racism and sexism and embracing diversity, Shane travels to a gathering of African American Muslim leaders. Director/Producer Jennifer Maytorena Taylor’s work has shown at venues like the Sundance, Los Angeles, San Francisco and Locarno Film Festivals, International Documentary Festival Amsterdam, Sundance Channel, Al Jazeera, and NHK-Japan.Her filmsinclude Message To Zaire/The Talk for PBS,Daisy and Max for Al Jazeera,Visiting Day for The Atlantic,New Muslim Cool for POV,the feature film Paulina, and the Emmy Award-winning Home Front. Director/Cinematographer Mustafa Davis as lived and worked extensively throughout the Middle East, Asia, and Africa as a filmmaker, photographer, and educator.Fluent in Arabic, his directing credits include the long-form films The Warm Heart of Africa, Prison Blues,and Deen Tight. PBS: What do you hope others take away from your story? Shane Atkinson: I hope people will see my story and come away with the understanding that we can never give up on each other. It is tempting to look at those we may disagree with and say they are the problem and they are nonredeemable. Though we can't control others, we can look inward to see if we are the best version of ourselves. Rather than demonizing those we may disagree with, we should always be true to our best selves and take the high road. A verse in the Qur'an elaborates: 'Good and evil cannot be equal. Respond 'to evil' with what is best, then the one you are in a feud with will be like a close friend."